Is the "Big Easy" back? It's a question travelers to New Orleans will be asking for some time. Memories of fl oodwaters and scenes of survival linger like the high-water marks, which stain the region's estimated 276,000 abandoned homes. Yes, the devastation is real; yes, it is tragic. Yet, through its music, food, and rich cultural heritage, the Crescent City is slowly regaining its mojo. Night descends on Bourbon Street. My driver "Brother Rolls" got his name because, as he asserts, "he can roll with anyone" - lately, that's included rolling with adversity. At 62, he is trying to put the pieces of his life back post-Katrina. His ten children and extended family of 36 are either living in FEMA-supplied trailers, or have been displaced across the South from Texas to Atlanta. Brother Rolls tells of wading in murky chest-deep waters as he struggled to evacuate his home, but as we pass the Superdome, his voice strikes an optimistic note. Below the dozen or so men repairing the stadium's roof hangs a massive banner: "Coming Soon," it proclaims, "September 24, 2006 New Orleans Saints vs. Atlanta Falcons." "The Saints are coming back," he says, "and we got a new quarterback, and that Reggie Bush, he's gonna be great." Football is back, 20,000 of the city's 25,000 hotel rooms are full (there were 80,000 rooms before the storm), and tourists are again flocking to the French Quarter and Garden District ... there is life at the mouth of the Mississippi. Eating entirely too much is a time-honored New Orleans tradition. Within an hour of being dropped at Marriott's Renaissance Arts Hotel in the middle of the Warehouse/Arts District on 700 Tchoupitoulas Street, I'm standing in a line outside the famed Poydras Street institution, Mother's. The red brick walls of the soul food restaurant's unassuming exterior are covered with "Help Wanted" signs: busboys, waiters, cooks, etc. Like Mother's, the city of "NOLA" seems be getting back on its feet. The oyster po' boy and jambalaya, both rich and filling are well worth the wait. Cafe Du Monde on Jefferson Park at Decatur Street is the perfect spot for a cup of iced Cafe' au lait and a beignet to get the blood flowing before a humid stroll through the French Quarter. 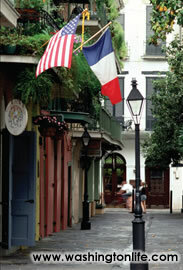 Canal Street was flooded after Katrina, but the Central Business District, downtown and French Quarter are back. Bourbon Street is still one step away from resembling spring break in Daytona. The Quarter's eclectic boutiques are stocked with fashion, and the art galleries remain tucked away between the 18th and 19th century Spanish and French-influenced balconied three-story buildings. 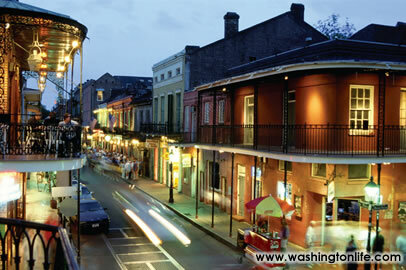 At night, the rhythms of zydeco and blues continue to mix with the sounds of revelers partying until dawn. 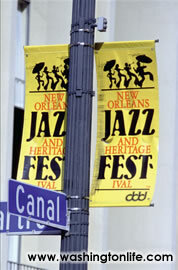 The theme for Jazz Fest this year was "rebirth." Along with food, drink and music, art is the fourth pillar of Crescent City culture. Exploring the Quarter and up-and-coming Warehouse/Arts District holds the promise of discovering a vibrant, unknown artist. Located west of Canal Street, the district is the future of the New Orleans creative scene. The neighborhood is now home to stylish and trendy loft apartments and a number of galleries, including The Ogden Museum of Southern Art (925 Camp St.); Ariodante (535 Julia St.); Arthur Roger Gallery (432 Julia St.), and Steve Martin Studio (624 Julia St.). 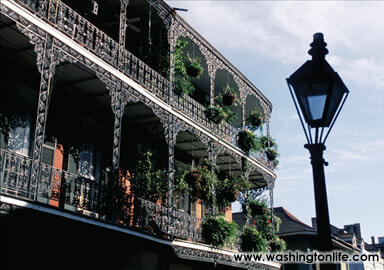 Iron awnings await in the French Quarter. 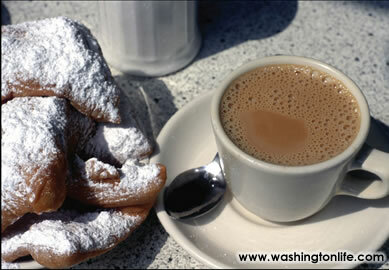 Beignets and Cafe' au lait - a Big Easy tradition. Dinner at LaCote Brassiere in the Renaissance Arts Hotel brings a promise of (even more) food as well as a visit by chef Chuck Subra Jr. - a Louisiana native, who mixes the French influences from Aux Saint Loraine with Creole favorites. His wasabi crusted quail served over baby bok choy and Japanese eggplant ($23) is a perfect example. Down the block at Emeril's on the corner of Julia and Tchoupitoulas, the Food Network's biggest star, Emeril Lagasse, is hard at work in one of his two New Orleans restaurants. For a more traditional French-inspired upscale dining experience, Restaurant August (301 Tchoupitoulas St.) is always a safe bet. Other musttrys are Brennan's (417 Royal St.), Commander's Palace (1403 Washington Ave.) and K-Paul's Louisiana Kitchen (416 Chartres St.). Back on Canal Street over a seriously tender filet mignon and fresh lobster tail, Shula's Restaurant President Dave Shula is explaining the merits of corn-fed beef as well as the fact that Shula's is the first new business to open up in downtown since Katrina. Another New Orleans staple, Jacques-Imo's (8324 Oak St.) is back as well - and getting a table is as difficult as ever. Secondline parade at Jazz Festival. It's Sunday 11 a.m. and I'm on the corner of what used to be Derbigny and Deslande in the 9th Ward. The road dead-ends at a cream-colored 20-foot high cement levee, which is being built to protect the neighborhood from another devastating flood. To think that the number of homes destroyed in Louisiana and Mississippi is nearly equal to the total amount of homes in the D.C. area is sobering. The houses (that are still standing) have been stripped of all dry wall and contents, leaving them to stand as mere shells of their former selves. Driving through these ghost neighborhoods, I wonder if the city, like the endless stretch of empty houses passing before me, can ever be rebuilt? By 2 p.m. of the same day, any doubts I have about New Orleans losing its spirit are stripped away as I wander through the New Orleans Jazz and Heritage Festival's ten stages of blues, jazz, zydeco, salsa, gospel, bluegrass and folk music. 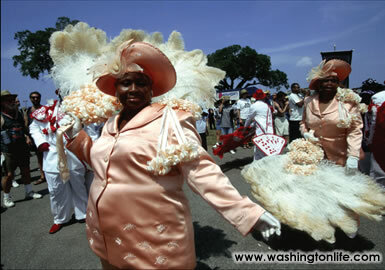 Resurrecting the soul of the Big Easy was the theme of this year's Fest. With each note of music, the soul heals a little bit more. There is a spirit in New Orleans that refuses to go quietly, if at all. The resilience is exemplified by legendary blues musician Fats Domino, who was scheduled to end this year's festival on its penultimate Sunday. Unfortunately, Domino fell ill on his way to the festival. But on his trip to the hospital, he dutifully stopped by the main stage and thanked everyone for coming. New Orleans, like its native son, might be hurting, but it is not down. Both are on their way to recovery and thoughtful enough to thank those who still believe in this city's unique place in the American experience.